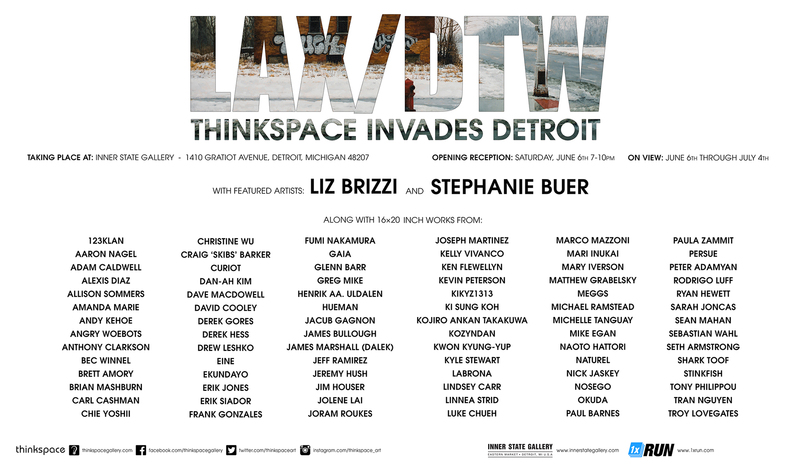 Los Angeles based gallery Thinkspace has teamed up with Inner State Gallery in Detroit, Michigan to present ‘LAX / DTW’. This special exhibition has been curated by Thinkspace and serves as an amazing introduction to the burgeoning New Contemporary movement for art lovers in the Midwest. With roots firmly planted in illustration, pop culture imagery, comics, street art and graffiti, put quite simply the New Contemporary Art Movement is art for the people. Featuring new works from over 50 artists from around the world, ‘LAX / DTW’ will kick off with an opening reception on Saturday, June 6th with two of the owners of Thinkspace on hand. Portland based artist Stephanie Buer explores derelict and abandoned urban spaces in her meticulously detailed oil paintings and charcoal drawings. Looking to the barren architectural vestiges of industry, Buer explores the life of marginalized structures once they’re divested of function and condemned to vacancy and neglect. Buer is fascinated by the living histories of absence, and by the poetic solitude of remnants; these buildings, once brimming with purpose and commercial enterprise remain untenanted reminders of human desertion and waste. Stephanie Buer’s work is inspired by an untiring search for the spectral half lives of desolate spaces. Ever in search of dissonant juxtapositions and interesting details, Buer captures the poetry of imperfection in the graffiti marred walls of abandoned factories, and in the permanent vacancy of old buildings overgrown and dispossessed by the progress of nature. Initially, Buer began her search for these urban ruins and relics in the abandoned industrial recesses of Detroit. From these early urban explorations sprang an interest in the stories of structures, and in the spatial poetry of architectural remains. Her works are very much about the process of looking, of excavating beauty and value from inglorious castoffs and flawed fragments. Critically, her work encourages the viewer to consider the larger significance of a culture that pursues indiscriminate and unsustainable development; the abandoned buildings themselves endemic of the progress that once necessitated their development. Buer reminds us that things continue to live, even once they have been discarded. Los Angeles based, French born, artist Liz Brizzi’s mixed media collage paintings combine photography, paper and acrylic washes of paint on board to build complex and layered graphic works that capture the architectural specters of the urban core. Brizzi is an artist adrift and in search of the mutable lives of structures. Through her travels, Brizzi has sought to capture the cultural specificity of her subjects, looking to the ways in which architecture speaks of its city’s past and present. A central component of her practice involves the undertaking of urban “safaris” on which she seeks and arrests the absentia of industrial relics and buildings through photography. Her work can be defined as architectural portraiture, seeking the evasive identities of these receding and often forgotten edifices. Whether in a decrepit neon sign, a vacant alley way or a gutted building, Brizzi excavates the lives of partial vestiges. In the absence of human subjects, the works focus on these architectures and environments as living entities subject to the ravages of time and neglect. Brizzi’s gritty and colorful works are ambient, and capture the moodiness of these urban hauntings with impressionistic license. At once graphic and painterly, the works are often composites of fractured moments and vistas. Architectonically devised compositionally, the panels are nonetheless as deeply emotive and stirring as they are technically impressive. They feel both holistically bound and fragmentary – a beautifully injured vision of remnants and unknown hollows. An avid traveller with an interest in Japanese philosophy, particularly the tenets of Wabi-Sabi which expound an appreciation of transience and imperfection, Brizzi is a spatial poet in search of ragged edges and haunted fissures. Founded in Los Angeles in 2005, and located in the Culver City art district since 2009, Thinkspace was established with a commitment to the promotion and dissemination of young and emerging art. The gallery is a catalytic conduit for the emerging art scene, and is dedicated to the exposure of its tenets and its artists. This movement, straddled between popular culture, graphic art, design, and street art, is subject to steadily increasing global expansion, and is in need of institutional advocates. Thinkspace is positioned to create opportunities and a visible platform for its recognition and proliferation. The movement is young, but significant, and Thinkspace’s aim is to establish both a curatorial forum and a collector base for its output. As an institution, Thinkspace is committed to vision, risk, and the exceptional talents that wield it. From the streets, to the gallery, from the “margins”, to the white cube, Thinkspace is re-envisioning what it means to be “institutional”. As a haven for talent, and a venue founded in passion, conviction, and community, the gallery’s mandate is rooted in projections for its future longevity. We intend to be a vehicle for the talents we vet for year’s to come, and are passionate advocates for their vision and their dreams. 1xRUN is the premier online destination for exclusive one of a kind artwork in any and all forms. Working with leading and emerging artists from around the world, 1xRUN is focused on bringing limited-edition time released artwork to collectors across the globe. Here at 1xRUN, our artists are a special breed and so are our customers. We strive to offer a one of a kind product that suits both and is unlike anything else in the marketplace. 1xRUN was founded by the team at Inner State Gallery ( formally 323East) in Detroit’s Historic Eastern Market. Over the past 6 years, we’ve worked with hundreds of amazing artists, both locally and internationally, and we’re constantly adding new artists. Formed out of years and years of developing trusted relationships with our favorite artists, gallerists and curators, our team is a rotating band of artists, filmmakers, musicians, writers, photographers and designers. We do this because we love it. We get up every day and love coming to work, because we work on what we love. We’re here to tell you that mail-order is still fun.